If you could ask ONE question to one of the world’s most creative magicians, what would it be? If you’ve never been to a magic lecture, there’s never been a better time. 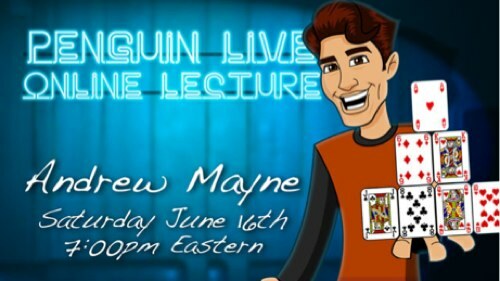 Saturday June 16th at 7:00pm, we’re live-streaming Andrew Mayne in a spectacular 2-hour interactive online lecture. Watch, ask questions and learn things you won’t find in any book or DVD. Purchase the Andrew Mayne LIVE “product”. This is your ticket. On Saturday, June 16th, anytime before 7:00pm Eastern, click the “MyPenguinMagic” area at the top of the Penguin site. You’ll see the livestream appear 1 hour before showtime. At 7pm sharp, Andrew will hit the stage and begin his JAM-PACKED professional lecture. Ask Andrew Mayne questions and discuss the tricks DURING the lecture. DON’T WORRY IF YOU MIGHT MISS IT. Reserve your seat anyway. Within 24 hours of ending, you’ll be able to download and/or watch the full lecture on-demand, and go over all the great routines and subtleties as many times as you want. It’ll be waiting for you in your “MyPenguinMagic” area. Magicians flock to see “workers” give talks. Why? Because these guys see and learn things that you won’t find in any book or DVD. Yes, you’ll be learning some incredibly powerful A-material, but the INVALUABLE stuff will be the insight you learn along the way. This lecture is for everyone, from the beginner to the professional and for magicians and mentalists alike. Don’t miss it! 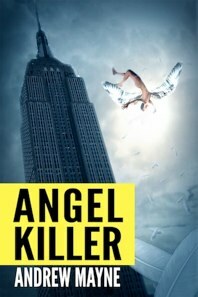 In front of security cameras, a tourist vanishes from the top of the Empire State Building and mysteriously falls to her death moments later in Times Square. A young girl dies crawling out of her own grave after having been declared dead a year earlier. On a Fort Lauderdale beach, a missing World War II airman and his aircraft show up as if he died only hours before. Andrew Mayne, the author of Public Enemy Zero and The Chronological Man series brings you an edge-of-your-seat ebook triller that only he could write. At last… Never pay for a drink again! Get the girl’s number and become the center of the party. 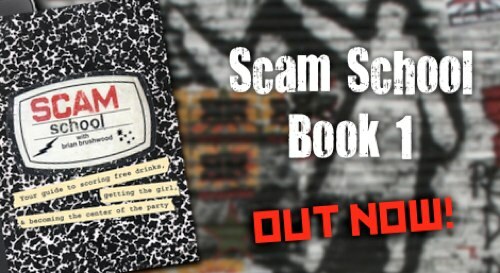 Scam School Book 1 is jam-packed with over 80 tricks from the popular web series Scam School. With material spanning over 200 episodes, you’ll learn the very best bar scams and tricks, guaranteed to impress. Packed with exclusive bonus content, including audio commentaries and embedded video demonstrations, Scam School Book 1 is perfect for both new and returning fans of the series. Andrew Mayne, the author of Public Enemy Zero and The Chronological Man series brings you an edge-of-your-seat triller that only he could write. Heard your friends talking about Andrew Mayne’s books but don’t have the coin to pick one up? Now you can listen to his first three book for free in audiobook podcast form. The Grendel’s Shadow: T.R. Westwood, distinguished professor of biology and the galaxy’s greatest hunter is in for the biggest challenge of his career. When an unknown animal starts killing off settlers on a backwater planet run on coal and steam power, he’s the only person who can help stop the slaughter. GET The Grendel’s Shadow audiobook HERE! Public Enemy Zero: The world is out to kill Mitchell Roberts. A strange virus is on the loose sending everyone he comes in contact with into a homicidal rage. He’s got to stay a step ahead of everyone around him if he doesn’t want to get ripped apart alive. 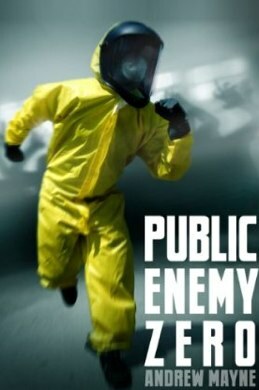 GET Public Enemy Zero audiobook HERE! 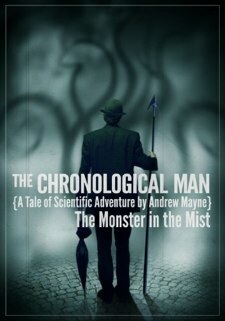 The Chronological Man: The Monster in the Mist: When the citizens of Boston begin to go missing in the fog in 1890, it’s up to the mysterious Smith, inventor and adventurer, to figure out what’s going on with the help of his assistant, April Malone. GET The Chronological Man audiobook HERE! 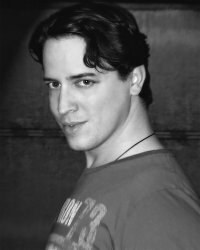 Are you a fan of Andrew Mayne’s fiction books? Would you like to know all the inside scoop on what’s coming next? Sneak peaks at projects in progress? Free un-published anywhere else short stories? If you happen to already be signed up for Andrew’s Magic mailing list, please be advised this is something totally different. The breakout Science Fiction author of 2011 is waiting to invade that brand spanking new eReader of your choice. If you found yourself a Kindle Fire or iPad 2 under the Christmas tree this year you need to snag entire Andrew Mayne catalogue, all for under $4. Since they all cost .99¢ each, you can have hours and hours of critically acclaimed, groundbreaking SciFi writing for less than the price of lunch. Find all of Andrew’s books here or download them directly from your eReader or smart phone using the Kindle, iBooks or Nook store apps. 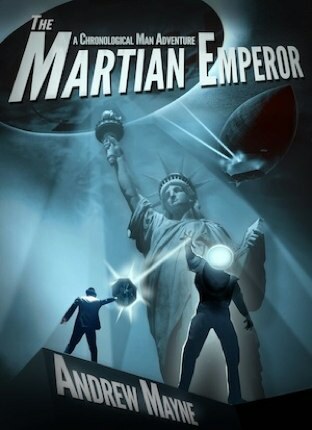 The second book in The Chronological Man series, The Martian Emperor combines mystery, airship battles and back room Tammany Hall politics against the backdrop of a world on the verge of war. Available for all Kindle platforms including iPhones, iPods, Android and Windows 7. Want to Spend New Years Eve with Brian Brushwood & Justin Robert Young? What are you going to be doing New Years Eve? A whole bag of nothing, that’s what. Why not kick 2011 in the pants with your friends? Brian Brushwood will be performing his full magic show, Justin Robert Young will be hosting the event and we’ve even heard unconfirmed reports of dungeon master Andrew Mayne being in attendance. Music? They will be joined by DJ Skratchy, who is nationally recognized for being one of the industries most elite DJ and RemoteKontrol, a group of three enormously talented poppers. Where and when? I’m glad you asked. 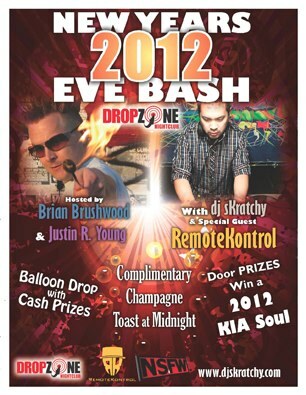 Saturday December 31st–DROP Zone Nightclub presents. . .
Posted in Sponsored Post | Comments Off on Want to Spend New Years Eve with Brian Brushwood & Justin Robert Young? It’s 1890 and the citizens of Boston are beginning to go missing in the fog. The police are confounded. The public is frightened. The city is on the edge of hysteria. It’s up to the mysterious Smith, inventor and adventurer, to figure out what’s going on with the help of his assistant, April Malone. They’ll have to face off against a secret society, corrupt policemen and a mad psychologist hell-bent on dissecting Smith, in order to solve the mystery of what’s going on and to save the city from an even more sinister threat. A fast-paced 45,000 word tale of science adventure, this novella is the first story about Smith, a curious man combining elements of Doctor Who, Sherlock Holmes and Tony Stark. You can have it for only 99¢ on the Amazon Kindle store. A spectator signs a card. They’re given an undeveloped photograph to hold. The card is lost back in the deck. 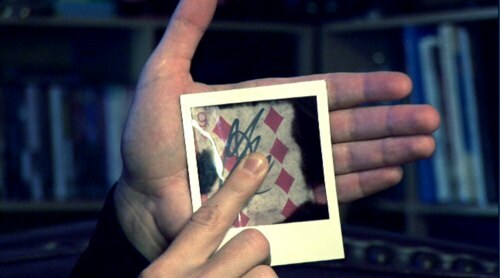 Before their astonished eyes they watch as the photograph develops into an image of a hand holding their signed card. Photosynthesis is a powerful way to reveal a word, an image or a signed card. Photosynthesis from Andrew Mayne on Vimeo. No camera required. Comes complete with the Photosynthesis gimmick and a 24 minute instructional DVD including several routines. Photosynthesis is a utility prop you can use to make startling revelations. It looks like an ordinary undeveloped instant photograph but will reveal anything you like including words, cards, images and even signatures. Photosynthesis gives you the magic of instant photography revelations without the need for film or an instant camera. Completely reusable, it’s heat activated and can be held in a spectator’s hands. Get yours now for just $24.95. Get The Book That Inspired Brian Brushwood’s Scam School For Only .99! Brian Brushwood of the Weird Things podcast wants you to get drunk. For free. And he will show you how to do it step by step in this .99 eBook Cheats, Cons, Swindles and Tricks: 57 Ways To Scam A Free Drink. In fact, it’s the very book that inspired the hit Revision3 series Scam School. How’d you like to never pay for a drink again? How about having complete strangers pay for your meals? What if you always had a few tricks up your sleeve to break the ice at parties or get the girl’s phone number? “Cheats, Cons, Swindles and Tricks” is full of 57 of the very best bar scams and tricks, picked up in Brian Brushwood’s 12 years of worldwide travel. As seen on the Tonight Show with Jay Leno (twice!) as well as 2 dozen other TV programs, Brian’s now the host of the popular online series “Scam School,” (downloaded over 1 million times a month, and named by iTunes as a “top video podcast” of 2008 and 2009). …And THIS is the book that started it all. With 57 killer tricks (and 8 bonus scams), any one of these tricks could win you the cost of a free drink or more… and yet your investment will be LESS THAN 2 CENTS PER TRICK! Short enough to digest in an evening, yet powerful enough to score you free drinks for the rest of your life… “Cheats, Cons, Swindles and Tricks” could be the single best investment of 99 cents you’ll ever make. Posted in Sponsored Post | Comments Off on Get The Book That Inspired Brian Brushwood’s Scam School For Only .99! Gritty science fiction/western comes to life when T.R. Westwood is called to hunt down a mysterious creature murdering villagers on the outskirts of a world technology forgot. Andrew Mayne’s first novella The Grendel’s Shadow has garnered praise from Amazon readers and consistently ranked among the science fiction charts, find out why when you pick it up via the Kindle store for only .99. In a galaxy filled with millions of worlds, his specialty is evening the odds for the ones with technological restrictions. Rocks and spears or shotguns and canons, he’ll use whatever is allowed to get the job done. The Grendel’s Shadow is 35,000 word novella mixing elements of post singularity science fiction, steampunk, horror and western. 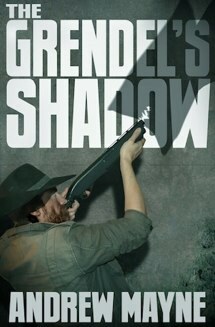 If you’ve enjoyed Andrew’s other books including Public Enemy Zero or Chronological Man, you will love The Grendel’s Shadow. Also, pick up The Grendel’s Shadow audiobook as read by Justin Robert Young for only $2.95. You are currently browsing the archives for the Sponsored Post category.